Place spinach in a 1 qt microwave dish with 2 Tbsp. of water. Microwave covered at P10 for 1 minute. Drain, chill and chop coarsely. In a large bowl beat cream cheese until smooth. Add mayonnaise, parmesan, Old Bay™, milk, garlic, basil, and spring onions and mix until well blended. 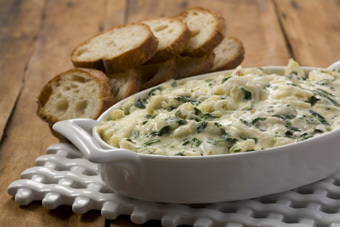 Add chopped spinach and fold in crabmeat. Place crab dip mix into a microwavable 9" glass pie plate. Spread evenly. Microwave at P10 for 3 minutes.